Written by Doug Powell, each of these books takes the reader on an in-depth search of different aspects important to the Christian faith. The books aren’t a boring tome, though. Each one is designed to look like a stack of documents, using different graphics and fonts, to introduce you to the evidence that has been discovered over the years. They follow a logical progression, but the goal is not to just tell you, “This is how it is, so you have to believe it.” Instead, the idea is to push you to do your own research and (ideally) come to the conclusions that “Yeah, this is probably really true” on your own. The books are good for a variety of ages (we read them aloud with all three boys), but the reading level is roughly 11 and up. We read the Biblical Archaeology one first, and it was fascinating. It starts with a short explanation of what archaeology is (the study of history through what has been left behind – artifacts, sites, and other physical evidence), but then dives right into the Old Testament. The first exploration is the Flood, and then a separate section on the search for Noah’s Ark. It moves through the Old Testament, covering such topics as the Exodus, whether or not King David was real (there were no non-biblical records of him found until 1993), the Dead Sea Scrolls, and Old Testament copies. From there, it flows right into New Testament archaeology, though there isn’t as much of the book dedicated to that as the Old Testament. The New Testament portion of the book covers things from the life of Jesus – Jerusalem during that time, judges of the time, and the Shroud of Turin. The Old Testament book was just as fascinating as the Biblical archaeology book, and is laid out in a similar fashion. It starts with a brief explanation as to why the Old Testament even matters to us anymore since our faith is based on the teachings of Jesus. “Shouldn’t that, then, be enough?” The short answer is that it mattered to Jesus, so it needs to matter to us. 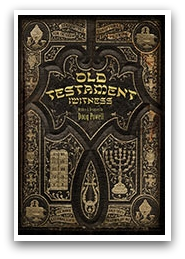 Old Testament iWitness explains the criteria that was placed on the books of the Old Testament to be considered canon. It tells us how seriously the Jews were about the copying of Scriptures: if even the tiniest error was found, it was not corrected; the whole copy was thrown out instead. From these basics, the book then moves through the Old Testament by type of book (Torah, Major Prophets, Minor Prophets, Scrolls, Wisdom Books, and History Books). Some of these sections are separated by things that are important to understand before moving on to the next. One example of this is the spread that explains how Moses was used to become the standard for all future prophets. This section is between the Torah section and the Major Prophets section. Old Testament iWitness concludes with a two-page spread on how the Old Testament relates to the New Testament and then a timeline. 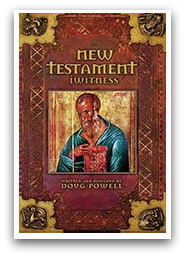 And now, my personal favorite: New Testament iWitness. Like Old Testament iWitness, the New Testament book explains how the canon was established. This section would be especially beneficial if you (or some of your friends) struggle with things like the Council of Nicaea. 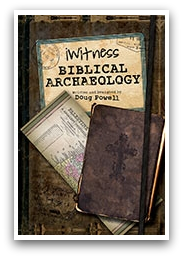 New Testament iWitness clearly explains how and why the books that are included, were included. Ever wonder why books such as The Acts of Paul or The Epistle of Barnabas aren’t included? It covers that, too. A lot of time in this book is spent on the copying methods of the New Testament, which was quite interesting. It’s not the same as the Old Testament, which I found fascinating. And finally, there is a section all about textual criticisms, which would be great for showing to someone (a non-Christian or a professing Christian with doubts) to help them understand that a lot of the criticisms raised actually do have answers. We took a break from our other Bible curriculum (also from Apologia, you’ll remember) to study these books during the review period. I read them aloud to the boys. They really wanted to read them themselves, but it was a bit tricky because of the layout of the books. Because they aren’t traditional books, it could be hard to decide where to read first (for example, when the text sections on the page are “paper” on the bottom left and upper right, do you read top to bottom or left to right?). Additionally, some of the fonts chosen were difficult to read. I thought all of the fonts were very interesting looking (most were handwriting-style fonts), but sometimes the lowercase N looked a lot like a lowercase H or vice-versa. This would be my only criticism; the content of the books was phenomenal, so there’s nothing for me to critique there. Would I recommend these books? That would be a resounding “Yes.” These quality books (available for $14 each from the Apologia website) are great for teaching your family or inciting conversation among friends.